Is the tiger extinct in Cambodia? Will the Mexican wolf be reclassified? The Zorilla, also called a Striped Polecat or African Polecat is a member of the Mustelidae family, and really does resemble a skunk. 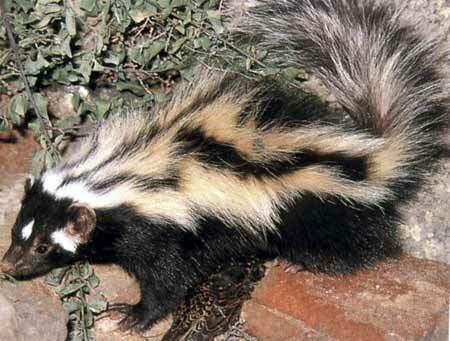 The animal is mainly black but has four prominent white stripes running from the head, along the back to the tail. The Striped Polecat is typically 60 centimeters long including a 20-centimeter tail. Striped polecats are found throughout the African continent. They are distributed in all habitats occurring between the Mauritanian coast and the coast of Sudan, and southward to the South African coast. Zorillas are almost strictly nocturnal, but some have been seen foraging around dusk and dawn. They seem to lead fairly nomadic lives, and sleep in hollow trees and rock crevices. They may also dig burrows or cover themselves with twigs and leaves when other suitable sleeping places are not present. Although polecats are efficient swimmers and climbers, they prefer the terrestrial life. When foraging, a zorilla will walk or run with its backs held in a firm arch and its tail in the vertical position with the tip bent down. This loping gate is something like that of a mongoose. Very little is known about the social life of wild zorillas, and they appear to be mainly solitary. In captivity, but several families have been kept together and grooming appears to be common among them. Some will roll over and present their dark undersides for grooming. Even though large numbers are seldom encountered together in the wild, their captive behavior suggests that they may not be highly territorial. The Striped Polecat is solitary, tolerating contact with others only to mate. Young are generally born between September and December, with one to three young per litter.